VIERO - Uomo dell' Isola di Tanna, una delle nuove Ebridi nel Mar Pacifico. / Homme de l' Isle de Tanna, une des nouvelles Hébrides dans la Mer du Pacifique. VIERO, Theodorum. - Uomo dell' Isola di Tanna, una delle nuove Ebridi nel Mar Pacifico. / Homme de l' Isle de Tanna, une des nouvelles Hébrides dans la Mer du Pacifique. Uomo dell' Isola di Tanna, una delle nuove Ebridi nel Mar Pacifico. / Homme de l' Isle de Tanna, une des nouvelles Hébrides dans la Mer du Pacifique. - VIERO, Theodorum. 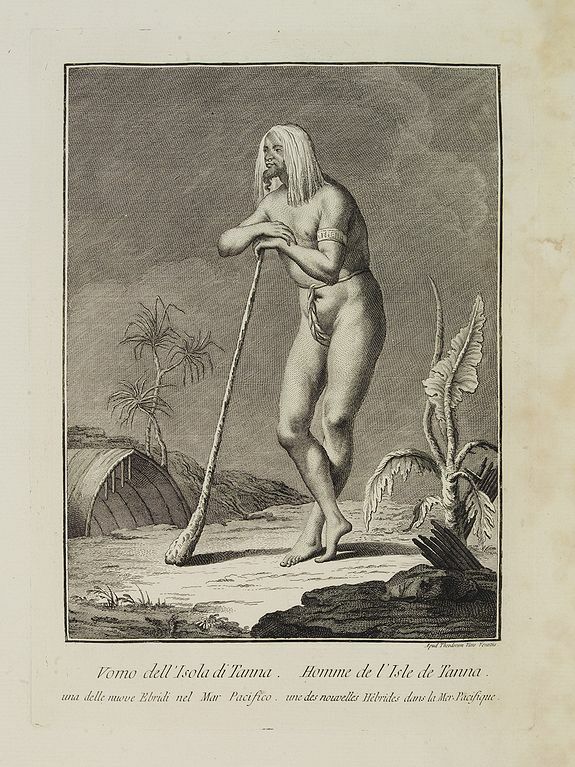 Title : Uomo dell' Isola di Tanna, una delle nuove Ebridi nel Mar Pacifico. / Homme de l' Isle de Tanna, une des nouvelles Hébrides dans la Mer du Pacifique.. Description :Full portrait of a man from the island of Tanna in the Pacific. A rare engraving from "Raccolata di stampe ... di varie nazioni". From the original drawing by William Hodges, who accompanied Cook. By Teodoro Viero (1740 - 1819), engraver and publisher in Venice. From a series of historically significant eighteenth-century copper plate engravings by Venetian engraver Theodoro Viero (1740-1819). Dating from 1783-90, the engraved print on laid paper is among the earliest European representations of indigenous Pacific peoples, and depict inhabitants of New Zealand, Tahiti, the Marquesas, Vanuatu, New Caledonia and Tierra del Fuego. Born in Bassano, Italy, Theodoro Viero studied under Venetian engraver Niccolò Cavalli, before settling in Venice and establishing his business as a miniaturist, burin engraver and print publisher. While publishing a large number of plates by other printmakers, his own output included reproductions of works by Venetian masters including Canaletto, Tiepolo and Giovanni Battista Piazzetta. Published just a few years after Captain James Cook's voyages to the South Seas, Viero's prints owe much to William Hodges, the artist aboard Cook's second Pacific voyage of 1772-75, and the engraved versions of Hodges' drawings published in 1777 in Cook's "A Voyage towards the South Pole, and Round the World. . . ". However, while Hodges' figures were mostly head and shoulder studies, Viero fleshed out this source material to create standing or seated semi-classical figures, posed within a variety of Arcadian settings. Faces and costume details of Viero's figures, together with details of their settings, link directly to those in the Cook voyage illustrations.